Based on my recent blog posts, about all I eat is breakfast and dessert. I thought it was about time that I posted a full meal again. Dinner is usually pretty basic: a meat and three vegetables, often minimally prepared. I am happy to eat this way because I like to taste the flavor of my foods rather than mask them with excessive seasoning. On weeknights I have limited time to cook, and it’s fast to grill or broil some meat and steam some veggies. It’s a satisfying meal, but nothing to blog about. 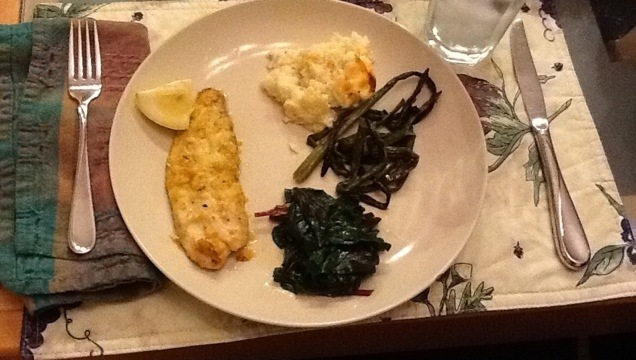 The other night Dora was gracious enough to make her famous fish sticks, so I had time to be more creative. I split the difference between the recipes and preheated the oven to 400. 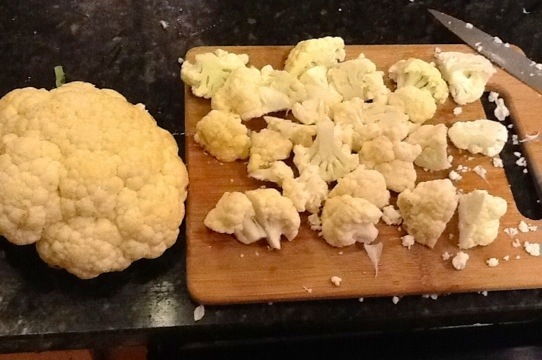 Chop the cauliflower into florets. 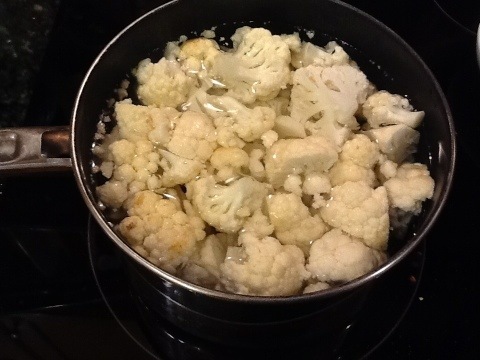 Boil cauliflower in salted water until soft, about 15 minutes I think. 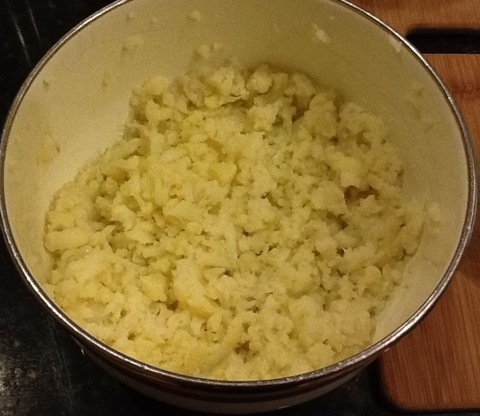 While the cauliflower is boiling shred the cheese. 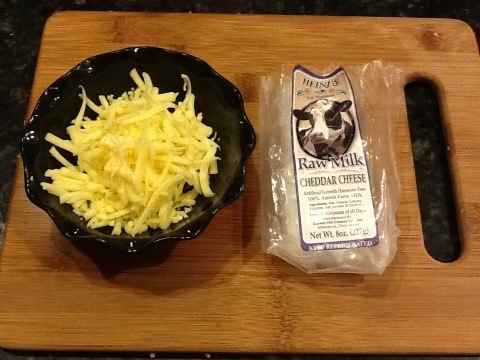 Jewel and and I love this raw cheddar I found at Earth Fare. Never buy shredded cheese. The anti-caking agents ruin the taste and texture. 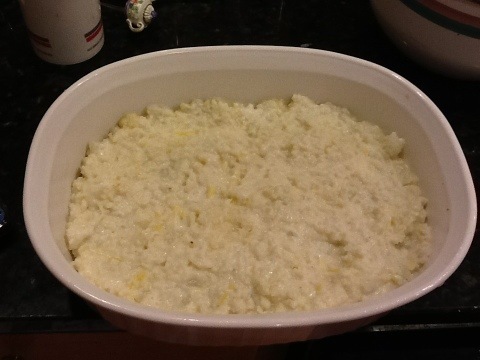 The final result of mashing. See what I mean? 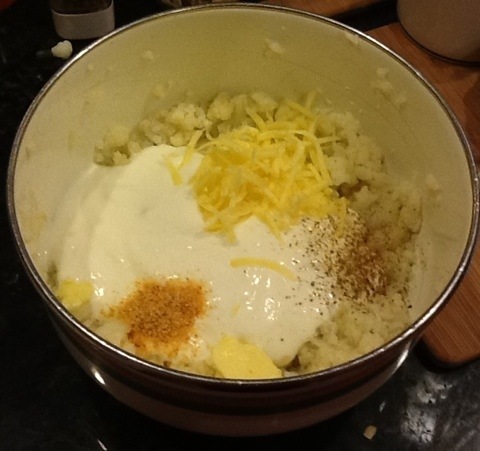 Add the butter, green onion, sour cream, and 1/2 of the cheese. I used onion powder since Tom doesn’t like crunchy onions. It turned out that we didn’t have sour cream, so I used full-fat yogurt instead. I don’t recommend that substitution. This tastes much better with sour cream. 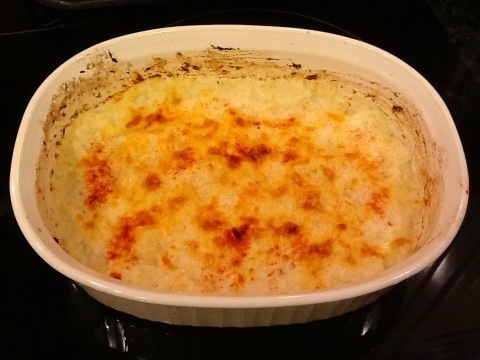 Place mixture in greased casserole dish and bake for 15-20 min or until bubbly. For fish seasoning I used Penzey’s Forward. Isn’t this an awesome label? It’s so 1977. I’m mentioning this seasoning and the shrimp butter because I think they were both key to the wonderful results I had. 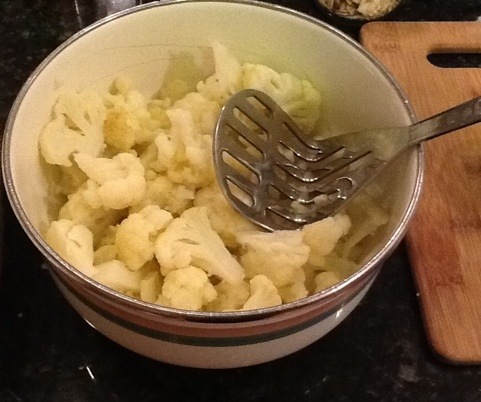 Melt the butter in a bowl and mix the dry ingredients in a pie plate. 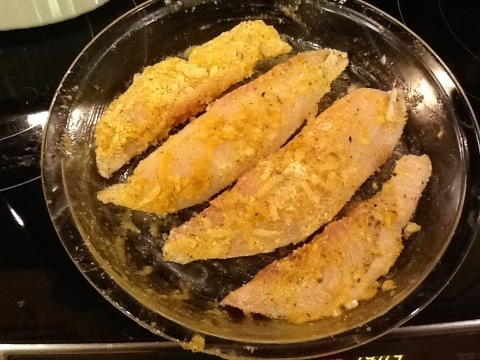 Cut the fish fillets in half lengthwise. 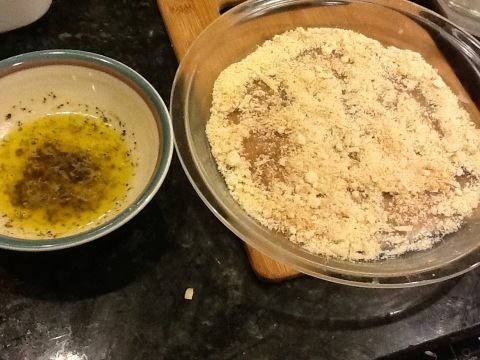 Dip them in the butter and then dredge them in the flour, sprinkling them with more flour if necessary. 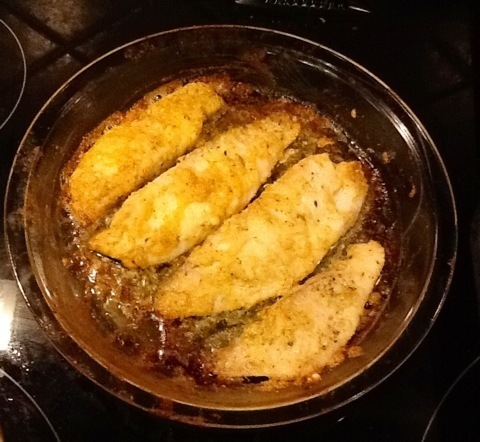 Place fish onto a greased pie plate or baking pan. Bake for 20-25 minutes or until golden brown. Take out the casserole and stir. Sprinkle with remaining cheese. I sprinkled it with paprika as well to make it pretty. 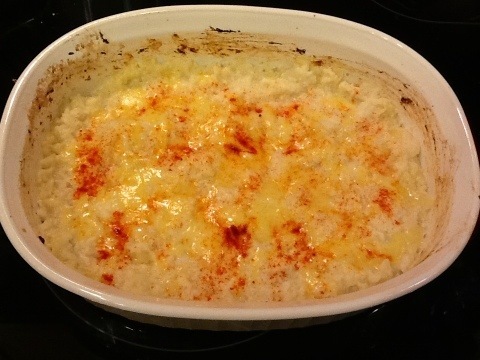 Return casserole to oven. At this point I also put the leftover asparagus in the oven to heat up. Wash the beet greens. I cooked the beet roots as well and made marinated roasted beets the next day. They were the best beets I’ve ever had. They were especially good in salads. 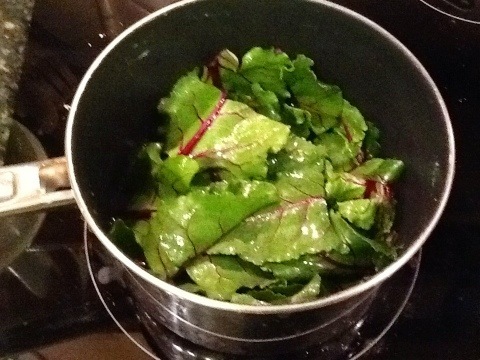 Steam the beet greens in a little water until tender. Drain and toss with olive oil. I ended up broiling the casserole for a few minutes to brown the top. Here’s how the fish look when they’re done. My dinner. 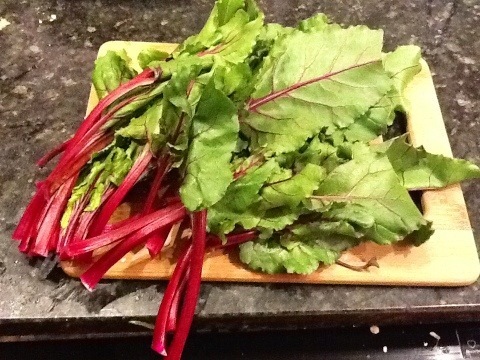 The surprise hit of the night was the beet greens! 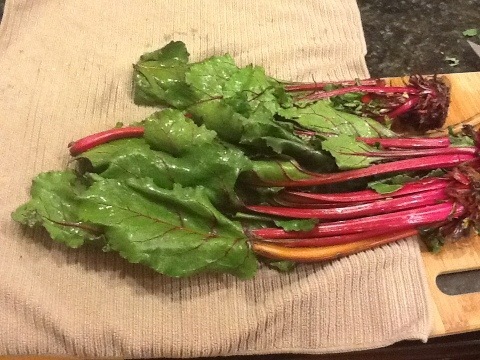 Jewel and Tom thought they tasted like a sweeter version of Swiss chard. The only problem was that they didn’t like the roots! Oh well, I’ve really come to enjoy marinated beets on my salad! 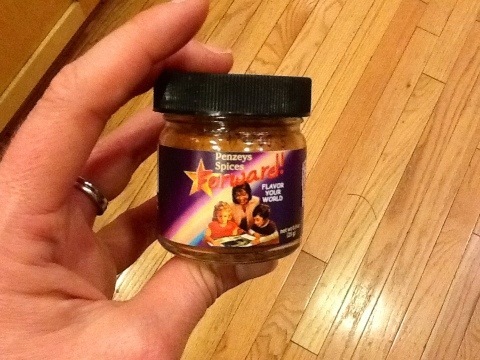 Jewel and Tom also liked the Almond Parmesan Tilapia. 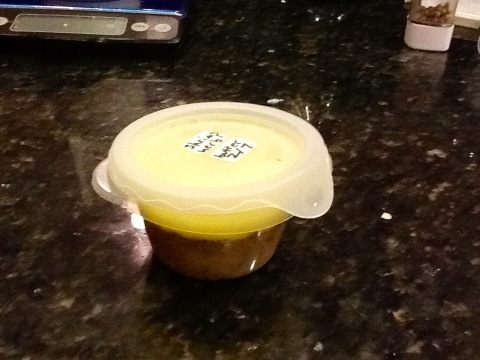 Jewel told me that it was very smart of me to think of putting the shrimp butter on it. I try to tell the about ideas like that so that they learn to be creative cooks themselves. Another great meal and nutritious. Love the recipes and the photos and the family comments.